Workington community choir, the Carnegie Singers hosted a professional orchestra and soloist last weekend thanks to funding from Cumbria Community Foundation. 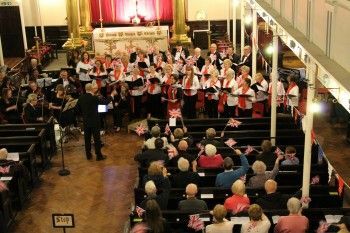 The Community Concert held at St John’s Church in Workington involved more than 70 local people and commemorated 70 years since the end of World War Two. Norman Brayton, Chairman of Carnegie Singers said: “The choir and the local community all benefited from the concert; to be able to have an orchestra of strings, wind, brass and drums as well as a professional soloist greatly enhanced the performance of the choir and the overall enjoyment of both the audience and the choir. The non-profit community group received £500 from the Rowan Community First Fund earlier this month to support the cost of the professional orchestra accompanying the singers on the evening. Cumbria Community Foundation has over 80 funds supporting community groups and individuals across Cumbria. To find out more about the Rowan Community First Fund or any other of the funds available visit our grants page or call 01900 825760.